Dutch food culture has received some lovely influence from Turkish immigrants and their descendants. This has resulted in many variations on traditional foods, such a lahmacun, also known as Turkish pizza. It's basically a pan fried flatbread with tomato meat sauce baked onto it. The flat bread is stuffed with salad and rolled up. 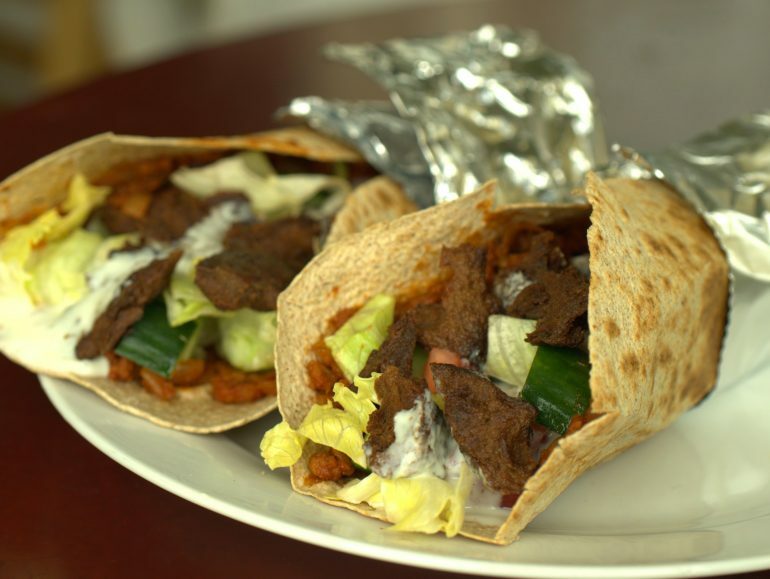 In Holland we like to eat our lahmacun with garlic sauce and other unusual furnishings that you won't see in Turkey. This delicious meal can easily be made vegan and low carb. I like to use tvp for the meat. You could get storebough low carb wraps, or make your own with this recipe. If you have the wraps ready, this is a relatively quick meal to prepare. Put the tvp in a small cooking pot and add water so it's almost covered. Also add the soy sauce. Bring to a boil and cook for five minutes or until the water has been absorbed. Heat a little oil in a skillet and sauté the onion and pepper for a few minutes until the onion is soft and translucent. Add the cooked tvp, tomato puree, garlic, harissa and a splash of water. Let it simmer for a few more minutes. Add a bit more water if it looks dry, but don't make it too wet. Mix the mayo, lemon juice and garlic powder to make a garlic sauce. Divide the tomato mixture over the wraps and spread it into a thin layer. Preheat another skillet (or clean the first one) and heat the 'pizzas' one by one, until they are toasty and have dark brown spots on the bottom. Watch so they don't burn and get hard. You can now also fry up the optional seitan or vegan chicken if using. Fill the warm pizzas with lettuce, tomato, garlic sauce and the optional seitan. For easier eating, it helps to wrap up one end in aluminium foil or parchment paper.